At the University of Massachusetts Dartmouth, the Paul Rudolph-designed Claire T. Carney Library is a beacon of activity even as work continues on its renovation by Boston architecture firm designLAB. DARTMOUTH — Student guides, giving tours of the campus of the University of Massachusetts here, used to inform visitors that the architect was a Satanist. UMass Dartmouth is that kind of architecture. Theatrical, a little weird, a little grim. If you once saw it, you maybe loved it, you maybe hated it, but you probably didn’t forget it. Designed in the late 1960s by one of the most inventive architects in American history, Paul Rudolph — no, he wasn’t a Satanist, at least as far as I know — the campus is a powerful, muscular pile of raw concrete. It’s an example of an architectural style that’s known, for better or worse, as Brutalism. Now one of the major chunks of UMass Dartmouth is being transformed. That’s the Claire T. Carney Library, which is being renovated and enlarged — redesigned, really, in many ways — by a talented Boston architecture firm that calls itself designLAB. The work isn’t quite finished, but much of the new Carney is already in use by students, and it’s clear that this is going to be one terrific piece of architecture. It’s a lesson in mixing the old and the new and getting a result that’s better than either. Let’s talk for a moment about Brutalism. It was a style that arose in France and Britain in the 1950s and ’60s, led by the legendary French modernist Le Corbusier. The name comes from the French “béton brut,” meaning raw concrete. It’s just by chance that in English “brut” sounds like “brutal,” but the name has stuck for good reason. Brutalist buildings tend to be, well, a little brutal. They’re usually made of industrial materials, especially concrete, a substance most people associate with highway ramps or gun emplacements rather than great architecture. What Brutalist architects loved was the fact that they could mold concrete into any shape. It gave them the freedom to be sculptors of architecture. Some of them, too, thought of the style as a political or moral statement, as a blue-collar aesthetic that wasn’t dressy, that didn’t cater to sentimental tastes. Some even delighted in having their work perceived as ugly. Maybe there’s an analogy with the heavy metal music of the era. Well, architecture, like other arts, doesn’t always have to be pretty to be good. Rudolph’s original Carney is a proof of that thesis. Massive concrete beams, walls, piers, and ceilings, which are deliberately left rough-surfaced, shape dramatic and unforgettable interior spaces. It’s as if you were walking through a series of boldly shaped stage sets, with lots of overlooks and trysting places. On the exterior, the building rises like a heap of blocks, becoming a kind of cubist mountain, a landmark image for the campus. DesignLAB’s architects get their role exactly right. They admire Rudolph, they’ve researched his intentions and worked to restore them, but at the same time they’re fearless about knocking down his stuff and adding their own. They do that wherever it’s needed to make a better experience for the library’s users. As you’d expect in any 40-year-old building, a lot needed to be done. Powerful though they were, Rudolph’s interiors often felt dark and cramped. DesignLAB has blown them open to let in floods of daylight, with sparkling new cluster lights to illuminate the spaces at night. They’ve added new floors and widened existing ones. Many of the books have been relocated to the basement, thus freeing up generous new study areas. Judging by the users, the Carney is a hit. On a recent late-afternoon visit, the study zones were packed with students and their computers. Rudolph understood that gray concrete needs to be set off by bright colors. DesignLAB researched his original tones and created a new color scheme based on them. Bold reds and purples, especially in the carpeting, make many spaces feel like landscaped gardens. Energy issues, always a problem with modernist-era buildings, are addressed with new windows, roofs, and mechanical systems. Surprisingly, little repair was needed on the exterior concrete, which has held up well. Cost figures are always debatable, but designLAB says that renovating Carney is significantly cheaper than demolishing and building new. The architects are quick to praise the clients, both the university and the state Division of Capital Asset Management, for their guts in backing the project. Working with designLAB as associate architect was the Cambridge firm Austin Architects. 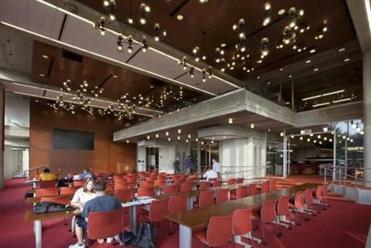 Inside the library, spaces have been opened up to let in floods of daylight, with sparkling new cluster lights for nighttime illumination. What I like best are the places where Rudolph’s Brutalism bangs right up against designLAB’s innovations. For example, there’s an area where massive concrete piers with rough gray coats, originally part of the exterior, are now sited in the interior because the building has been expanded around them with much added glass. They look like elephants wondering why they’re suddenly trapped in a glassy cage. There’s a wrinkle in time. I don’t expect to like everything when the Carney is finished, an event that’s still a month or two away. There’s a lot of dark new walnut paneling that looks corporate and lacks Rudolph’s zest. And we’ll have to see how the new all-glass outer walls will look and work once they’ve been fitted with the glass fins and screens that are intended to filter the sun. Paul Rudolph, who died in 1997, designed other buildings in Boston. Best known is his State Services Center on Cambridge and New Chardon streets, a massive rough-hewn concrete pile that deserves the name Brutalist if any building does. But there are also his more delicate Jewett Arts Center at Wellesley College and his First and Second Unitarian Church in the Back Bay, where he deftly inserted a new church into the burned-out ruins of its predecessor. Rudolph also chaired the School of Architecture at Yale from 1958-65. Brutalist buildings are currently so far out of fashion that many are in danger of being demolished. Are they worth saving? Every case is different, but the UMass story argues for a possible yes. It’s well to remember that Victorian architecture, too, was once considered ugly. Brutalism may, in fact, be making a modest comeback. Its fans, who tend to be younger architects, like to call it the Heroic Style. Rudolph’s Orange County Government Center in Goshen, N.Y., appears to be on the path to recovery after a bitter, nationally publicized demolition battle. 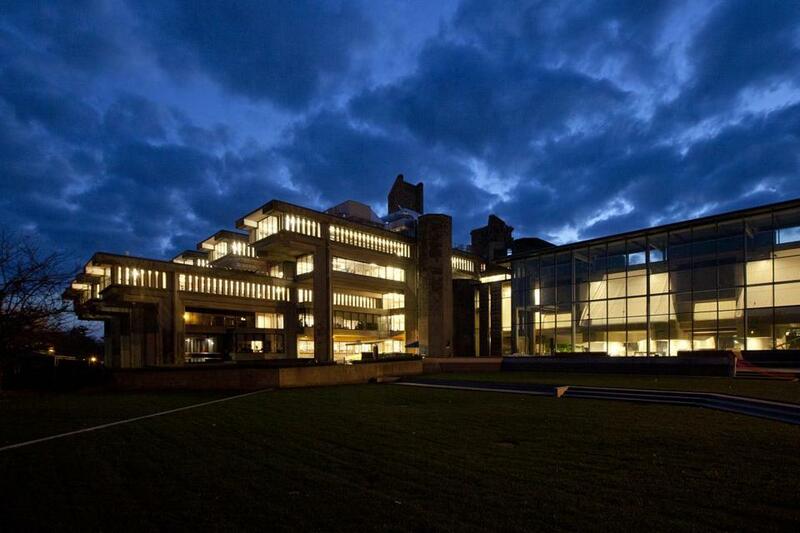 And there was a watershed moment a few years ago with the renovation of Rudolph’s most famous work, the Yale Art and Architecture Building, now renamed Paul Rudolph Hall. In a world of diminishing resources, it makes less and less sense to demolish and replace even a difficult and controversial piece of architecture like Rudolph’s old Carney. But the fact that a building was designed by a famed architect doesn’t mean you have to treat it as a sacred object, either. The Carney offers an important lesson: that often the best way to get a good new building is to grab a great old one, give it a good hard shake, and reinvent it for another era.